I bought this book because it had good reviews and is set in Tokyo – and what better way to prepare for a holiday? It’s a strange story, with unusual narrators and perspectives, and I really do feel that it gave me some insights into life in Tokyo. The story opens with Naoko, a 16-year-old girl, who is sat in a Tokyo cafe directly addressing her reader. She says that she is a time being and that she plans to write for her reader the story of her 104-year-old great grandmother Jiko before she dies. Nao is confrontational, sarcastic and has a very dark sense of humour. She texts stories to Jiko about dead prostitutes, which is especially odd because Jiko is a Buddhist nun, formerly a feminist anarchist novelist, now living in a temple in the mountains north of Tokyo. I meant to post this on Sunday but I was too busy actually taking part in NaNoWriMo to post about the fact that I’m taking part in NaNoWriMo. So yeah, after two fails in 2012 and 2013 and not taking part at all last year, I’m giving it another go. This means I’m reading less and might not blog much this month. If I manage to stick with it for once. But on the plus side I might have written a novel by the end of November – that’s exciting! Anyone else doing NaNoWriMo this year? If so, good luck! Keep at at! Though Cusk has written eight other books in-between, this new novel shares a lot in common with her first two books. There is a vagueness about it and a distinct lack of story, but there is also some beautiful writing. The narrator is an English divorcee writer (a little autobiography peeking through perhaps?) who goes to Greece to teach a writing class for a week. That’s pretty much the whole story. She speaks with a series of people, some friends, some random strangers, and recounts their stories. She has a knack of getting people to open up to her but reveals very little about herself. And yet she does seem concerned with the truth and questions the honesty of those she speaks to. I love Joan Didion and had been looking forward to reading this, her most famous work. It did not disappoint. Even her introduction is gorgeously artful, packed with lines I want to write on Post-its on my wall like when I was a teenager. This book collects together essays Didion wrote between 1961 and 1968. They’re grouped into three sections: “Life styles in the golden land”, all about California, “Personals”, which aren’t really personal but are reflections on a topic, and “Seven places of the mind”, which despite the title are about seven different physical places. Didion’s sketches of places and people are masterful – and distinctly Didion’s own take. She always takes an unusual angle. For example, her profile of John Wayne is a reconstruction of conversations on the set of one his last films. Her piece on Joan Baez centres around a neighbour’s complaint about Baez’s school, the Institute for the Study of Nonviolence. This book was one of the staff recommendations at Mr B’s Reading Emporium and I was attracted to the title and the sinister tone of the blurb. I waited until it was suitably wintry outside (it is set in Finland, after all) and then settled in for something magical. Ella Milana has recently moved back to her home town of Rabbit Back to teach literature and help her mother cope with Ella’s father’s decline into dementia. Rabbit Back is renowned throughout Finland, indeed the world, for being the home of acclaimed children’s author Laura White, who is not only a beloved bestseller herself, but also declared that she could take ten children from her home town and turn them into successful writers as well. To this end she formed the Rabbit Back Literature Society, to which she invited nine children who have grown up to become great writers. As Ella is both an adult and not a regular writer (she dabbles), she is rather taken aback to be chosen as the society’s tenth member. This passport to greatness appears to have been curtailed as soon as it began when at a dinner party thrown at Laura White’s house, a key person disappears in a cloud of snow. But Ella is still a member of this writers’ society and she is determined to dig up all its secrets, big and small, real and imagined. Why are words changing in library books? Why is society member sci-fi writer Arne C Ahlqvist (real name Aura Jokinen) creeping around Ella’s house at night? And was there a previous tenth member of the society who has been written out of its history? I love that when the first few strange things happen, including Ella’s invite to the society, she is too busy with her normal life to pay it all much heed. She has a job, difficult parents, her own preoccupations. This really highlighted for me how often in books characters jump to something new in their life with no regard for what they would otherwise have been doing. The story hints at and creeps into several genres. The overall structure is that of the detective novel, but it’s not clear whether any crime has been committed. Similarly, there are strange hints of the supernatural in various forms – ghosts, faerie creatures, magic – but nothing is definite, nothing is explained. Could it all just be over-fired imaginations? The imagination is certainly central to everything else in this novel. White has trained her writers to tap into their and each other’s deepest, most buried thoughts to fuel their writing. The whole town seems to believe in magical creatures, in dark shapes in the shadows become manifest. Even the dogs are behaving strangely. But there is also the beautiful possibility of imagination, the joy that books (and other writing – one of the society members writes for TV and another for film) bring. As Ella learns the rituals of the secretive society and unearths its and the town’s secrets, there is always the potential for something awful to come to light, but what is hidden is more often sad in an everyday way, or at least everyday for the world – loneliness, infertility, the death of parents, the love affair that ended. And yet somehow it isn’t a sad book, this tinge of sorrow underlines but doesn’t overwhelm the magical otherness, the sense of fun and adventure, the intrigue of mystery. There’s a black humour, a nod to the idea of the idyllic-seeming town harbouring dark secrets, but it’s so much stranger than that. Lumikko ja yhdeksän muuta first published 2006 by Atena Kustannus. This translation published 2013 by Pushkin Press. Source: Mr B’s Reading Emporium. I’m a David Mitchell fan. This fact crept up on me somewhat. Selecting which book to take for him to sign at a talk on Wednesday, I realised that not only do I own – and have read – all his books, but the last three I’ve bought in hardback pretty soon after their release. That I’ve loved them all goes without saying – why else would I keep on spending extra on them – but I do feel bad that I forgot to say that to Mitchell himself, it seems like something I should have said. I should clarify for fellow Brits that I am talking here about the novelist David Mitchell, not the comedian David Mitchell. They’ve both written books, they’re both great and they’re both touring the West Country this week, so I’d understand any confusion. Mitchell started by talking about his new book The Bone Clocks (which I finished reading last weekend – my review will follow soon). He says the idea for it grew from his own sense of his mortality as he reached his mid-40s, and death certainly is a recurring theme. This time, the structure is the seven ages of man, each set in a different decade and each having a different style of writing (though that makes it sound more experimental and disjointed than it is – this a coherent novel with distinct sections). There was quite a lot of discussion of The Bone Clocks that on reflection was a bit spoilery, so I won’t share too much of that. But Mitchell did talk about several overarching themes in all his books, such as alienation and difficulty communicating, which comes from a combination of his having a stammer as a child and his years living in Japan. He discussed how he writes all his books as a series of novellas, or long short stories, with the links between them being closer and more blurred in some cases (such as Black Swan Green) than others (say, Ghostwritten). He also acknowledged the growing “uber book” that is the world in which all his novels are set. This world-building, in which not only characters but also things from previous books reappear, started out of a sense of mischief but he soon saw that it has a certain utility – it enables improbable events to become believable and adds a sense of reality, because what is familiar feels real. When asked about specific reactions to his book, Mitchell replied “in the same way that you can’t successfully tickle yourself, you are immune to your tricks” as a writer, i.e. he’s never read his books as a reader. (He similarly fobbed off questions about genre, saying – quite rightly – that it’s not up to him to label his books.) But when reading other people’s books, he appreciates being pulled along or swept up by them. He made the important point that pace isn’t just plot – you have to have a connection with the characters to be swept up in a book and plot is the enabler of this connection. I’d say this awareness certainly shows in his work. Mitchell also talked about creating a sense of place. His books have been set all over the world, often in multiple locations, but they are always strongly placed. He said that writers are effectively location scouts, but also that “it’s my job to convince you that I’ve been there” – a job that can involve intensive research or a quick visit with his trusty notebook. After a mini love-in for Ursula le Guin, Mitchell listed his other favourite authors as Halldór Laxness, Anton Chekhov, Marilynne Robinson and Jun’ichirō Tanizaki, which is a suitably international top five for such a well-travelled man! Finally, Mitchell revealed that he is working on a book largely set in 1960s London and New York, due for publication in 2016. And even more excitingly, he has written a short novel (his first short book!) as a spin-off from The Bone Clocks and that will be published in 2015. It’s clearly a great time to be a David Mitchell fan. This event was part of the Bristol Festival of Ideas. It seems whenever I book tickets for something months in advance, life conspires to try to spoil it for me. Like last night. Once again, Tim wasn’t able to come with me (thankfully some friends from work also had tickets so I wasn’t alone for the journey there at least) and my knee was randomly super painful, particularly on steps. And St George’s Hall has a lot of steps (it is very pretty though). But on the plus side I got to see Margaret Atwood in real life and hear her speak and get her to sign not one but two books for me! So that part was pretty good. 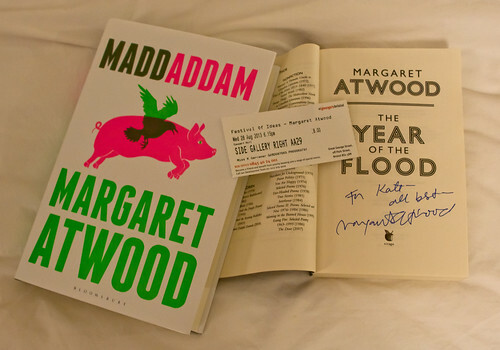 The event was primarily about the Oryx and Crake trilogy, and in particular the third book Maddaddam, which was published in the UK yesterday. So obviously I bought the brand new hardback and got it signed even though I have the other two books in paperback and now they won’t match or even fit on the same shelf. Oops. But it seemed like it would be silly not to, while I was there and she was there. Right? The interview started with the influences on the trilogy, which is perhaps an easy list to guess for anyone who’s read any of the books, but Atwood embellished with interesting facts and plenty of dry wit. There really are glowing green rabbits (created by splicing jellyfish genes with rabbit), which she says were originally developed for a magician, and spider-goats, developed to create bulletproof silk – “people have opened the genetic toybox and they’re mixing and matching”. When asked if she sees herself as a critic, observer, satirist or optimist of issues such as gene-splicing, Atwood replied that she’s all of those things (which is interesting as I thought the books came down firmly against, but perhaps I misread the tone). She went on to say that people are afraid of what they don’t understand and we’re right to be afraid of our own power but wrong to be scared every time. Anthropology and psychology seem to be big influences on Atwood (indeed, she subscribes to New Scientist and devours all the popular science, especially biology and epidemiology, she can). When asked about how she was able to describe people living after the, ahem, event of this trilogy, she made the acute observation that basic human traits, “our essential smorgasbord”, have not changed since the days of the caveman – we’re all susceptible to love, rage, jealousy, etc, therefore no changes in technology – or loss thereof – are going to change human emotions. Talking more generally about storytelling, Atwood said “the reader is the violinist of the text…I’m just the originator”. She also touched on a subject that fascinates me: the link between memory, language, storytelling and religion. Memory evolved to allow us to anticipate the future. And once a language has a past and future tense, we start telling stories, and an important part of that is a theology of where we came from. And that brings us back to Maddaddam, which apparently develops the religion of Crake’s children. There were many more highlights that I scribbled down but I’ll finish with the story that Atwood seemed most eager to tell: the cover design. The first cover she was sent was flowers and a bee: totally girly and not at all reflecting the content of the book. Inspired by Maureen Johnson’s excellent Coverflip challenge Atwood asked for something different, something dynamic and maybe even scary. It took a lot of revisions but you have to admit that the new cover may have pink on it but it sure isn’t girly. Freaky, unnerving and intriguing, yes. Oh yes I did. I signed up to NaNoWriMo again, despite last year’s mini meltdown and subsequent failure to “win”. I have had a title rolling around in my head for several months and am slowly coming towards an idea of what I want to do with it. This is the kind of book I went through a phase of reading several years ago – Asian country, female narrator, historical setting (often during a civil war) and generally following the daily life of poor(ish) folk. So I have some comparison. This one stood up well in terms of teaching me new stuff but less well as regards quality of story. Sadly. Lily is born in 1830 to a modest farming family in the Chinese province of Hunan. As second daughter she has little worth and is just another mouth to feed until the Matchmaker delivers surprising news: if her feet are bound properly, she will have perfect feet, which will secure her both a good marriage (which her family will benefit from) and a laotong – a lifelong best friend (other girls must leave their childhood friends behind when they marry). But secrets, reversals of fortune and an attempted peasant rebellion all threaten both her happiness and her friendship. The book is narrated by Lily, from her earliest memories aged five or so, and from the age of seven she is largely confined to the “women’s chamber” and discouraged from paying attention to the world of men, so we hear little about the history or politics of the time, but there is still plenty to tell. See did a lot of research into nu shu, the secret women’s writing, and frames her story around it, but she also details the horrors of foot binding, the rituals of daily life and special occasions to the point that I frequently felt I was learning a lesson rather than reading a story. It’s a fascinating lesson, and after years of research I understand why she wanted to use what she could, but it might have been nice to have a little more, I don’t know, insight? An invisible rebellion that no man can see. Let our life stories become tragic art. I can accept that their writing might have remained this rigid but in person too? They are often alone together – after they are married, when they visit they share a bed with each other and banish husbands to another room – so how come they never speak naturally even then? The insinuation of Lily’s narrative is that she insisted on this formality and in that way caused all the ensuing problems. But really? Maybe I am struggling with suspension of disbelief. I’m not saying it’s a bad book. I was very interested and entertained but I did not feel absorbed. First published 2006 by Bloomsbury Publishing. This is a strange and beautiful book. It has disjuncts that cannot be explained but somehow the whole works anyway. St John Fox is a writer in New York City with a sweet, devoted wife in Daphne and a spirited muse in Mary Foxe, who is no less of a threat to Mrs Fox because her husband made her up. After, all that makes Mary his perfect woman. Mary accuses St John of killing her off in one of his stories and so begins their game. His short stories are interspersed into the narrative, often starring Mary and/or himself. But the reality, after all, includes an imaginary woman, so is that just one of Mr Fox’s stories too? The stories are disconnected by place (Europe, Asia, Africa) but also time. Mr Fox appears to be living and writing in the 1930s but some of the integrated stories (possibly all?) appear to be set in the present. Not the 2010s as someone in the 1930s might have imagined it, but as it really is. There are also some stories that appear to have no link at all to Mr Fox and his two women, aside from the fact that he is trying to write a love story with a happy ending (at which he continually fails). These sound like problems or accusations, but they are somehow not. I loved this book. It is magical and inventive and surprising. Oyeyemi’s language is wonderful; simply phrased but with such imagination.